All material is ordered on a NAVSUP form 1250-1. The supply department handles all camp maintenance materials according to the Seabee Supply Manual, COM2NDNCB/COM3RDNCBINST 4400.3 on the steps for 1250-1s with specific job orders. Supply can track specific job order materials with the computer. The three-digit BM series field corresponds to the BRAVO company MCD project number. MLO can provide automated status reports with updated information on all MCD materials. MLO stages all MCD materials by individual project. This staging is done in the same manner as that used for tasked battalion projects. Only the CMO or the camp maintenance chief is authorized to transfer material from one job order to another once the material is staged. Both the supply officer (S-4) and the 2ndNCB/3rdNCB DET must be series. Turn back to figure 6-8 for additional details advised in writing when such transfers are made. Use the format in figure 6-17 to report this information. Figure 6-17. 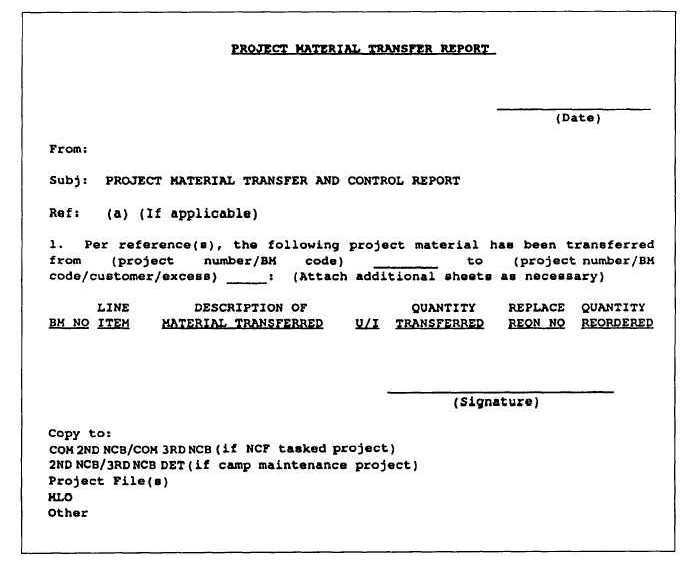 - Project material transfer report.